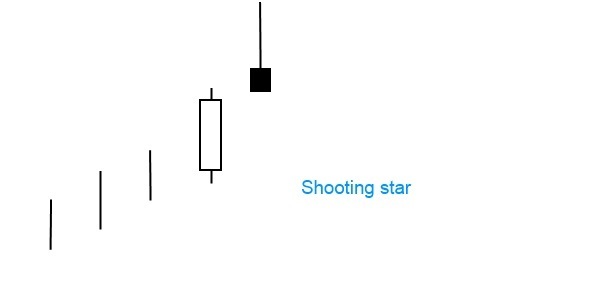 The shooting star candlestick formation is regarded as a bearish reversal pattern that typically forms at the top an uptrend. The first candlestick must be white and must have a relative large real body. The second candlestick is the star with a short black body that gaps away from the real body of the first candlestick. After climbing high the stock price closes near the opening price, as shown by the small real body and the large upper shadow. Typically, there is either no lower shadow or just a minor one. The upper shadow must be more than twice as long as the candlestick’s body. It is one of the four types of stars in candlestick theory: morning-, evening-, doji-, and shooting star. It looks just like the inverted hammer except that it is bearish in nature.